The Ocean King Game Board Software is a PCB that can be fitted into Fish Hunter and Fish Hunter Plus style machines for all new gameplay and has an oceanic theme where players can earn big! This super fun game upgrade kit is the perfect addition to any gaming area if you're looking to really boost your revenue. Players will genuinely enjoy the addictive game play of the Ocean King and with an eye-catching cabinet it will attract players from all across the floor time and again! With the Ocean King software, up to 6-8 players can go head-to-head in a race against each other to catch as many and more profitable fish as possible, scoring points to get the biggest payout! This simple concept is offset by fast, exciting gameplay that demands quick thinking, skill and co-ordination in order to be the best! Players simply use the joystick to aim your net gun at a target and when you have lined up a target, hit the 'SHOOT' button to try and catch the fish. You can also use the 'WEAPON' change button to change between the three guns at any time during the game, which have various net sizes and power levels. The main gameplay is fun and has exciting mini games, which are important to utilize to win the game. The game features a new cumulative super gun weapon, 16 types of fish (including four new species, such as the Ocean Lord Killer Whale) and three exciting mini game features! The mini game features include: - The Bomb Crab - when the bomb crab is captured by a player it explodes and the player can get extra points form the explosion if it affects other fish. - Chain Thunder - there are nine types of fish which are subject to chain thunder: snapper, clown fish, butterfly fish, fugu, lionfish, flounder, lobster, spearfish and octopus. Use the chain thunder to get up to nine kinds of fish at once and win extra points depending on how many fish, and how many different types of fish, are present on the screen at the time. - Twister - each fish (except devilfish, shark, killer whales, humpback whales and bomb crabs) have a twister feature. When a player picks up the twister feature, the fish with the twister feature at the time captures all the same fish near it for the player. The different fish up for grabs, including Clown Fish, Snapper, Lantern Fish, Devilfish, Lionfish, Saw Sharks, Butterfly Fish, Sharks, Octopi, Fugus, Lobsters, Spearfish, Sea Turtles, Flounder, the Ocean Lord Killer Whale, the Humpback Whale, and the Bomb Crab. This Ocean King Game Board Software is perfect for upgrading dated machines to give them new life and generate new revenue. The exciting and tiered like game play allows for a unique gam e each play and will attract players from all over the floor. The Ocean King Game Board Software is a PCB that can be fitted into Fish Hunter and Fish Hunter Plus style machines for all new gameplay and has an oceanic theme where players can earn big! This super fun game upgrade kit is the perfect addition to any gaming area if you're looking to really boost your revenue. Players will genuinely enjoy the addictive game play of the Ocean King and with an eye-catching cabinet it will attract players from all across the floor time and again! With the Ocean King software, up to 6-8 players can go head-to-head in a race against each other to catch as many and more profitable fish as possible, scoring points to get the biggest payout! This simple concept is offset by fast, exciting gameplay that demands quick thinking, skill and co-ordination in order to be the best! Players simply use the joystick to aim your net gun at a target and when you have lined up a target, hit the 'SHOOT' button to try and catch the fish. You can also use the 'WEAPON' change button to change between the three guns at any time during the game, which have various net sizes and power levels. The main gameplay is fun and has exciting mini games, which are important to utilize to win the game. The game features a new cumulative super gun weapon, 16 types of fish (including four new species, such as the Ocean Lord Killer Whale) and three exciting mini game features! The Bomb Crab - when the bomb crab is captured by a player it explodes and the player can get extra points form the explosion if it affects other fish. Chain Thunder - there are nine types of fish which are subject to chain thunder: snapper, clown fish, butterfly fish, fugu, lionfish, flounder, lobster, spearfish and octopus. Use the chain thunder to get up to nine kinds of fish at once and win extra points depending on how many fish, and how many different types of fish, are present on the screen at the time. Twister - each fish (except devilfish, shark, killer whales, humpback whales and bomb crabs) have a twister feature. When a player picks up the twister feature, the fish with the twister feature at the time captures all the same fish near it for the player. The different fish up for grabs, including Clown Fish, Snapper, Lantern Fish, Devilfish, Lionfish, Saw Sharks, Butterfly Fish, Sharks, Octopi, Fugus, Lobsters, Spearfish, Sea Turtles, Flounder, the Ocean Lord Killer Whale, the Humpback Whale, and the Bomb Crab. This Ocean King Game Board Software is perfect for upgrading dated machines to give them new life and generate new revenue. The exciting and tiered like game play allows for a unique gam e each play and will attract players from all over the floor. Game board can run a 55 inch LCD display with big table-board, more space, more fun! Full 3D graphics bring you the real appearance of the undersea world and simulated fishing net to catch the fish. Three interchangeable guns, including the new Cumulative Super Gun! 16 types of fish to catch and heaps of different scenes to enjoy. Can be setup for 6 player or 8 player cabinet. Coin in, coin out model (bill acceptor with coin input, coin output with thermal printer output option available). 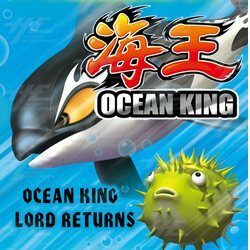 Ocean King is a fish hunting video redemption arcade game available exclusively from Highway Entertainment. The gameboard for Ocean King is an upgrade from Fish Hunter Plus, and is available to purchase as a new Ocean King machine or a gameboard to upgrade an existing machine. Ocean King is an upgrade to the original Fish Hunter Plus Arcade Machine, featuring new exciting gameplay that will reinvigorate veteran players and excite the new. A key improvement present in Ocean King is the ability to choose between three different guns, which change the bet ratio from the ranges of 1-99, 100-499 & 500-1000 credits.